Did you know that there are actually several varieties of zucchini, including white zucchini? Contrary to its name, white zucchini is actually pale green in colour and just a few inches in length. They are simple to cook with, but can also be eaten raw when thinly sliced. In Mexico, white zucchini is often cooked in soups or used as a filling for quesadillas. In Italy this variety of zucchini are served in a many ways but when they are served breaded and pan-fried they are an Italian zucchini lover’s delight. Zucchini is low in calories which makes this vegetable a dieter’s choice and delivers important nutrients such as folate, potassium and vitamin A. 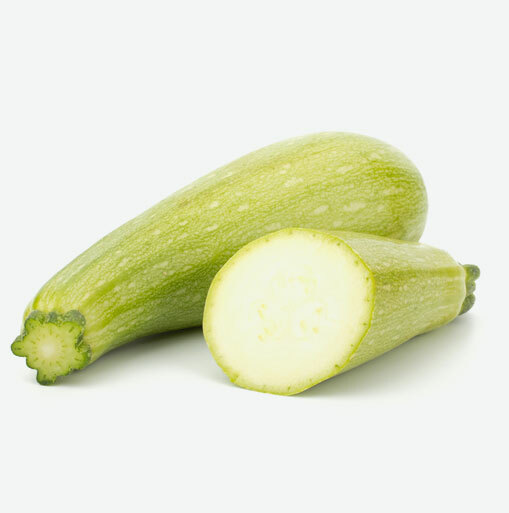 White zucchini also has good amounts of vitamin C, fiber and phosphorus. Thoroughly scrub each zucchini under running water until the skin feels clean. Cut off and discard the ends. White zucchini is tender and is considered perishable so use this vegetable within a couple of days of purchase. The skin of white zucchini is soft and edible. This vegetable cooks fast so that makes it a great vegetable to use when you need a quick meal. Depending on the recipe you choose, white zucchini can be grated, sliced, diced, stuffed, breaded, or used in baking.